I WAS introduced to Yuki Urushibara’s manga after watching its beautifully-made anime counterpart. And while the manga does not have the anime’s delicate watercolour tones or its haunting music, the stories with a touch of Japanese folklore remain as mysterious and enchanting. In this world, there are “mushi”, invisible beings whose existence creates unique and often unpleasant side effects on people. (Just how unpleasant? How about making nightmares a reality or taking over the bodies of babies?) Although some appear like the monsters we see in shonen anime and many are dangerous, mushi are not malicious creatures. Like humans and animals, their instinct is to survive, and if humans suffer because of them, it’s just an unfortunate side effect of their nature. Thus Ginko, the phlegmatic hero of this manga, is more of a knowledgeable biologist than an exorcist. 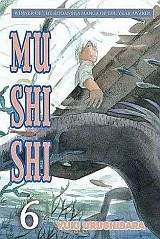 Although as a “mushishi” he does battle mushi’s “evil” side effects, he respects their right to exist at the same time. But no matter how benign they are by nature, Ginko also realises that he sometimes has to kill them to save the afflicted human being. It often leaves him a little sad. Urushibara unveils the mystery slowly, like a blooming flower. Very often, the reader is left with a sense of tranquillity and peace; the price of co-existing with mushi may be high, but life goes on, it would seem. However, the real lure of the stories lies in the human drama within. It is no wonder then that the manga won the Excellence Prize at the 2003 Japan Media Arts Festival and the 2006 Kodansha Manga Award for general manga. IF you’re an anime fan and you’ve not heard of Bleach, it could be very possible that you’ve been living under a rock the past few years. The blockbuster anime, now with 213 episodes (in Japan) and several OVAs under its belt, is an inescapable titan. It is adapted from Tite Kubo’s manga of the same name, and centres around the adventures of Kurosaki Ichigo, a teenager who is able to see ghosts and who also happens to be a shinigami (death god) in his spare time. As a shinigami, his job is to vanquish “Hollows”, evil spirits who are formerly lost souls. And like most shonen manga, Ichigo starts out quite useless, but after battling many, many, many formidable enemies, he becomes quite a threat himself. And I mean that literally, as readers of Vol.25 will find out that Ichigo is battling his dark side or “inner Hollow” – for the control of his body! 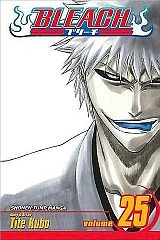 Readers will be entertained by Bleach’s fast, flashy action and somehow, judging from the popularity of both manga and anime, the repetitive plot device (Ichigo has to battle yet another great enemy) still manages to attract. After all, the manga is in its 37th volume in Japan. This is mostly due to Kubo’s fast-paced storytelling, solid (albeit bloody) fighting scenes, likeable characters and wonderful character designs – no two are alike and each has a very distinctive look. Readers have grown to love the characters – good or bad – that have been painstakingly developed by Kubo. 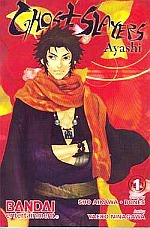 Ghost Slayers Ayashi is a rare exception for manga adapted from anime. Readers are treated to mostly new stories which revolve around the anime characters. Even if some of the stories are a rethread of the ones found in the anime, the mangaka offers a different slant to the tales, enough to surprise regular watchers. The manga, like the anime, is about a special fighting force established during Japan’s Tenpo era (circa mid-19th century). Its mission is to eradicate “youi”, supernatural creatures of Japanese legends that are currently creating havoc in the country. The most powerful member appears to be Ryudo Yukiatsu, a former masterless samurai and “floater” (basically a drifter) who is able to draw power from words. His power (dubbed “ayagami”) is a source of much fascination (if not headaches) for the reader as it’s almost always incomprehensible – at least to those unfamiliar with the Japanese writing system. Fortunately, those who have not seen the anime will not feel lost as there is an adequate, albeit simplified, introduction to the story and characters. The icing on the cake is Yaeko Ninagawa’s beautiful art – the battle between Yukiatsu and a particularly formidable foe in Vol.2 is breathtaking. These factors combine to make Ghost Slayers Ayashi one of the best demon-busting manga to collect. IN a medieval-ish land where monsters (called “yoma”) masquerade as human beings, live among them and then eat them for lunch (literally), life is almost unbearable. Fortunately, the people have saviours of sorts in Claymores – half-human, half-yoma women who are the only match for the monsters. But these Claymores do not vanquish yoma out of the goodness of their hearts. Villagers who cannot pay for their services are left to their grisly fates. The organisation that controls the Claymores is made up of people whose motives and tactics are questionable and sometimes, as despicable as the yoma. Norihiro Yagi’s manga is loaded with complex issues; the fight between good and evil is full of grey areas. Similarly, the characters are as complex and readers will enjoy the variety and their great character development. The character design and art is equally awesome, and we see it most in the design of the yoma, who are hideous yet beautiful. Despite their obvious malevolence, the yoma are actually creatures of a tragedy. They are, after all, former Claymores who lost a mental battle to rein in their yoma side, becoming the creatures they once hunted. 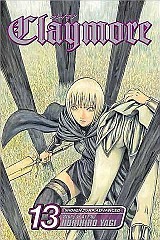 Claymore’s unpredictability is the reason why it’s so enjoyable. You can never predict what Norihiro Yagi will throw at you next. YOSHIMORI Sumimura is a reluctant heir of his family’s legacy. Like his ancestors before him, the 14-year-old student is a “kekkaishi”; he vanquishes demons by trapping them in magical barriers and obliterating them. Being the Sumimura heir also means that he is duty-bound to patrol his school grounds every night (thus denying him of a good night’s sleep). His ego is dented by his rival and neighbour Tokine Yukimura, a much better kekkaishi. Despite his heavy task, Yoshimori is still a precocious teenager with a grand (and very cute) ambition of becoming the world’s best pastry chef and who nurses a serious crush on Tokine. 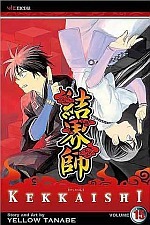 Although Kekkaishi follows the well-worn path of most shonen manga (hero grows more and more powerful after battling one monster after another), its charm lies in the humour found within its pages and among its endearing characters.